Noxious exhaust emissions from cruise ships calling at the city will be cut significantly if the vessels switch to using low-sulphur fuel or shore power, local think tank Civic Exchange says. Simon Ng Ka-wing, the centre’s head of transport and sustainable research, said there would have been a 71 per cent cut in sulphur dioxide emissions last year if the 2,185 cruise ships that called at Hong Kong had used low-sulphur fuel instead of the dirtier marine bunker fuel. Particulate matter emissions would have fallen by 60 per cent, he said. Low-sulphur fuel has a sulphur content of 0.5 to 1 per cent, compared with bunker fuel’s 4.5 per cent. Based on the 16 cruise ships booked to berth at the Kai Tak cruise terminal between June and April 2014, Ng said, sulphur dioxide emissions would be reduced by 83 per cent and particulate matter by 78 per cent if the vessels used cleaner diesel. But if they did not, they would emit 43 tonnes of sulphur, 44 tonnes of nitrogen dioxide and 5 tonnes of particulate matter in just this year alone, he said. Industry sources, however, argue that the vessels calling at Kai Tak in the first year will account for less than 0.4 per cent of the city’s total marine emissions. This included pollution caused by container ships, tankers, river trade vessels, ferries and pleasure craft, they said. “There would be a very substantial improvement by switching to low-sulphur diesel at berth,” Ng said. This would benefit residents in the pollution hotspots of Tsim Sha Tsui, Hung Hom and Kowloon Bay, where most cruise ships currently moor. Another option, Ng said, was to use shore power, which was more suitable at Kai Tak where there was space to install the equipment rather than at Ocean Terminal. But more research had to be done to see if shore power was cheaper and environmentally beneficial than low-sulphur diesel, he said. Civic Exchange hosted a workshop yesterday that attracted about 20 cruise and shipping industry representatives to brief the sector about its cruise ship emissions report. Ng said the paper was “a first step to engage the cruise industry in Hong Kong”. “By speaking directly to the cruise industry, we shall learn more about … what their major concerns are about government control and regulation,” he said. It hardly comes as a surprise to learn that curbing ship emissions at Hong Kong’s new cruise terminal is not regarded as a priority by the Tourism Board. When it comes to infrastructure projects in Hong Kong, environmental concerns are rarely allowed to stand in the way. The grossly wasteful and pointless Hong Kong-Zhuhai-Macau bridge is a case in point, and we do not have the slightest doubt that the airport’s third runway will go ahead regardless of the cost to taxpayers or the cacophony of protest from green groups. But we were astounded to see a report by local think tank Civic Exchange that warned of significant ship emissions in the six months after the terminal opens. Cruise ships using its two berths will emit 43 tonnes of sulphur, 44 tonnes of nitrogen dioxide and five tonnes of particulate matter. Okay, in terms of the marine emissions by container ships and the enormous volume of Pearl River delta traffic in Hong Kong waters such as river trade vessels, tankers and pleasure craft, the cruise terminal’s contribution to the total will be relatively minor. However, the Civic Exchange report goes on to say the emissions from ships using the cruise terminal can be cut by more than 80 percent if the vessels switch to low sulphur fuel while in port, or even plug in to berth-based electrical power while alongside. That sounds reasonable and a good idea. Our question is why wasn’t that covered in the environmental impact process before the project was given the go ahead? Why is it that only now, three months before the terminal’s two berths are scheduled to open, these emissions-curbing “options” are being mentioned? Newspapers reported that the cruise industry is “mulling the feasibility” of introducing low sulphur fuel or onshore power. They are understandably concerned over the costs of adopting a low emissions strategy, and in the absence of legislation forcing shipping to use low sulphur fuel while in port, you can bet the cruise operators will do nothing about it. The cruise terminal was approved by the former administration of Donald Tsang, a disastrous five-year period in the territory’s history that will be remembered for its profligate infrastructure projects plugged into the public purse. Still, if the current bunch of clowns running Hong Kong had any testicular fortitude they would ram through mandatory regulation that all vessels switch to low sulphur fuel while at berth, regardless of the cost to shipping. So far about 570 ships have registered for the Fair Winds Charter, a voluntary scheme to use low sulphur fuel to reduce ship emissions while alongside in Hong Kong. But they have warned that if there is no regulation in place by the end of the year, they will go back to burning the dirty stuff. Voluntary doesn’t work in business, at least not for long when it is costing shipping companies US$1.5 million a year to use the low emission fuel in port. Make it compulsory or laugh it off. There are signs that the government is paying more than lip service to environmental protection, but it remains to be seen if this administration puts a higher priority on public health than the previous one. For more than a decade, scientists have observed “ship tracks”in natural-color satellite imagery of the ocean. These bright, linear trails amidst the cloud layers are created by particles and gases from ships. They are a visible manifestation of pollution from ship exhaust, and scientists can now see that ships have a more subtle, almost invisible, signature as well. The map above is based on OMI measurements acquired between 2005 and 2012. The NO2 signal is most prominent in an Indian Ocean shipping lane between Sri Lanka and Singapore, appearing as a distinct orange line against (lighter) background levels of NO2. Other shipping lanes that run through the Gulf of Aden, the Red Sea, and the Mediterranean Sea also show elevated NO2 levels, as do routes from Singapore to points in China. These aren’t the only busy shipping lanes in the world, but they are the most apparent because ship traffic is concentrated along narrow, well-established lanes. The Atlantic and Pacific Oceans also have heavy ship traffic, but OMI doesn’t pick up NO2 pollution tracks because the shipping routes are less consistent. The shapes of landmasses force ships into narrow paths in the Indian Ocean, while ships in the Atlantic and Pacific tend to spread out over a broad areas as they navigate around storms. In addition, the air over the northeastern Indian Ocean is relatively pristine. Heavy NO2 pollution (dark red in the map) from cities and off-shore drilling activity along the coasts of China, Europe, and the United States obscures the ship tracks that might otherwise be visible to OMI. In the map, the Arctic is gray because the lack of light during the winter and frequent cloudiness during the summer prevented OMI from collecting usable data in the area. Urban areas and industrialization aren’t the only source of NO2 in the map. Agricultural burning in southern Africa and persistent westerly winds make an elevated band of NO2 that stretches from southern Africa to Australia. (In central Africa, easterly winds push pollutants from fires toward the Atlantic, keeping NO2 levels comparatively low over the northern Indian Ocean.) Lightning, which produces NOx, also contributes to background NO2 levels. Just how much shipping contributes to overall NOx emissions remains an open question for scientists. Research suggests that shipping accounts for 15 to 30 percent of global NOx emissions; scientists are using satellite observations to reduce the uncertainty in such estimates. OMI is not the only satellite instrument observing NO2 levels in the atmosphere. The Global Ozone Monitoring Experiment (GOME) instruments on the European Space Agency’s ERS-2 and MetOp-A satellites, as well as the SCIAMACHY instrument on the Envisat satellite, have made similar measurements. In 2012, Dutch scientists published a study combining data from all four instruments to show that the NO2 signal over major shipping increased steadily between 2003 and 2008, then dropped sharply due to the global recession and reduction in ship traffic. deRuyter de Wildt, M., H. Eskes, and K. F. Boersma (2012, Jan. 5) The global economic cycle and satellite-derived NO2 trends over shipping lanes. Geophysical Research Letters. Franke, K., Richter, A., Bovensmann, H., Eyring, V., Jöckel, P., Hoor, P., and Burrows, J. P. (2009) Ship emitted NO2 in the Indian Ocean: comparison of model results with satellite data. Atmospheric Chemistry and Physics. Vinken, G., Boersma F. (2011) From ship smokestack to global air pollution: bridging the scales to better constrain ship NOx emissions from space. (PDF) Solas News. Vinken, G., Boersma, F., Jacob, J., and Meijer, W. (2011) Accounting for non-linear chemistry of ship plumes in the GEOS-Chem global chemistry transport model. Atmospheric Chemistry and Physics. Wang, C., Corbett, J., Firestone, J. (2008) Improving Spatial Representation of Global Ship Emissions Inventories. Environmental Science Technology. NASA Earth Observatory image by Jesse Allen, using OMI NO2 data provided courtesy of Lok Lamsal, Aura Project Science Office. Caption by Adam Voiland, with information from Nickolay Krotkov, Anne Thompson, Geert Vinken, and Folkert Boersma. City pollution from cars smogging your view? Have a look at the coastal pollution in the map shown above. It’s not an atmospheric pollutant that you can see with your naked eye, but its presence can lead to cardiovascular and respiratory problems in humans. What is it? Nitrogen dioxide (NO2), which in elevated amounts lead to unhealthy levels of nitrogen oxides (NOx), fine particles, and ozone in the air we breath. Just what is causing this red alert pattern along the coasts? That’s the rub, it’s a combination of city pollution, off-shore drilling, and ship traffic. Ships and airplanes can both leave whispy cloud tracks called “contrails” in the air that are easily seen from space. Shaving Cream Prank or Ship Tracks? But the specific amount of NO2 that ships release near the coasts gets lost among the other emissions of nitrogen oxides from other pollution sources. Shipping is estimated to contribute 15 to 30 percent to the global NOx pollution. To test this, several satellites are monitoring atmospheric NO2 levels. 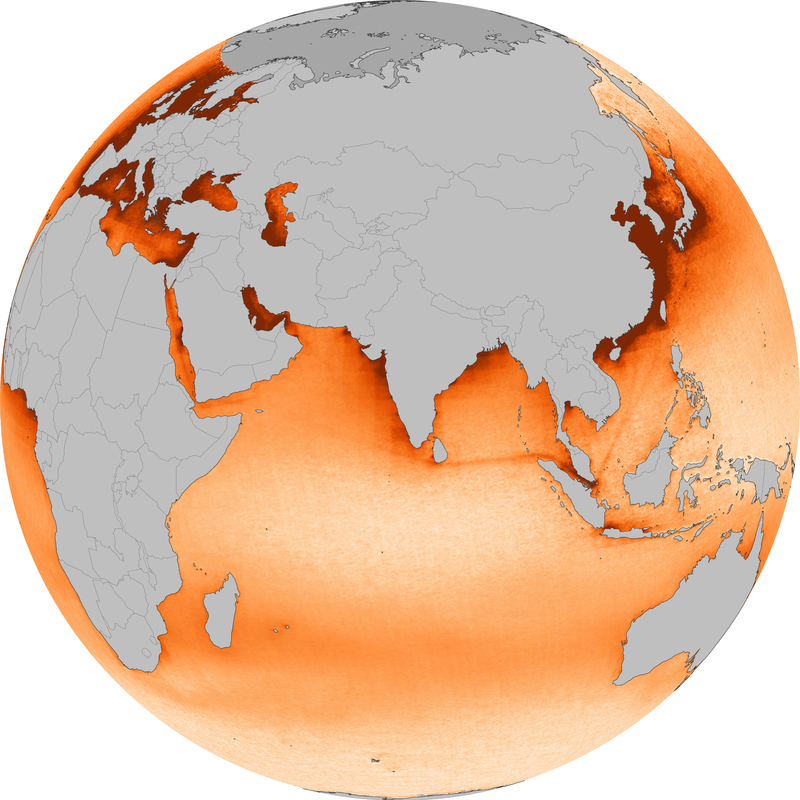 This map shows the ocean and sea-based contribution of NO2 into the atmosphere from 2005 to 2012 as measured by a Dutch and Finnish-built Ozone Monitoring Instrument (OMI) on NASA’s Aura satellite. Take a look at the difference between the hazy NO2 level drifting between southern Africa and Australia, the result of westerly winds blowing soot from fires in Africa across the Indian Ocean, and the distinct red line along the transoceanic shipping route between Sri Lanka and Singapore. Other areas of the ocean such as in the Pacific and the Atlantic have just as much shipping traffic, but the routes do not leave such a precise NO2 trail for the satellite to detect, because in those waters ships are often forced to skirt around storms. Earth and climate scientists work with maps like this one to help better evaluate the human contribution to atmospheric pollution. A rogue cargo ship is the likely cause of an environmental disaster that has left hundreds of birds dead after it flushed a glue-like pollutant into the sea, it was claimed today. Officials from the Maritime and Coastguard Agency are awaiting the results of urgent tests to establish what the mystery substance is before launching a hunt for an offending vessel. The MCA meanwhile launched a pollution surveillance aircraft to survey the English Channel while the Royal Navy and RAF were on standby to help. Experts said the leading theory for the cause of the pollution is that an oil residue was illegally flushed from a ship’s cargo tanks out at sea to save the time or costs of emptying it in port. It was feared several thousand birds, mainly Guillemots, have become virtually paralysed after swimming into the ‘waxy’ substance in the Channel. The substance, believed to be palm oil, has glued the birds’ feathers and wings together, preventing them from flying. There are also mounting fears that a 25,000-strong population of Auks off the Dorset coast may perish in the ‘ecocide’. Over the last 48 hours hundreds of seabirds have been washed ashore on beaches in West Sussex, Hampshire, the Isle of Wight, Dorset, Devon and Cornwall. Wildlife experts have so far rescued more than 250 birds alive but as time goes by it is feared the majority of birds now found will be dead. Because they are unable to take off or preen themselves, the creatures are at grave risk of freezing to death as they are washed onto the windswept beaches. Chris Packham, presenter of BBC’s Springwatch and Autumnwatch, said: “What’s particularly frightening is that hundreds have been picked up on the beach, there could be very many more which have died and been lost at sea. Dr Simon Boxall, an oceanographer at the University of Southampton, said: “The substance has the right characteristics to be palm oil. “We move a lot of it around the world and transport it in tens of thousands of tonnes at a time. “The fact this has affected such a wide area implies there is a reasonably large amount in the sea which is moving up the Channel and implies there has been a spill. “It is likely a ship has delivered some palm oil but needed to deposit residue from the tanks. “It takes time to do so and costs money so a few rogue ships have been known to flush out its tanks in the open sea, which can be several hundred tonnes. Although the majority of the birds affected are guillemots as they spend most of their life on the surface of the sea, other species that have been coated in the substance have been razorbills, kittiwakes, egrets and a baby puffin. Most of the rescued birds have been recovered along a 25 mile section of coast at Chesil Beach and the Isle of Portland in Dorset. More than 120 of them have been taken to an RSPCA centre to be cleaned using a mixture of water and margarine but at least 50 were found dead. Nearly 100 birds have been rescued from beaches in Torquay, Brixham, Teignmouth and Salcombe in Devon. Mark Smith, of the Dorset Wildlife Trust, has been leading an army of 18 staff in the search for birds along Chesil Beach. He said: “There are 25,000 auks off Dorset so the potential number of birds involved in this could be huge. “This is potentially quite a big environmental disaster. “Unfortunately as time goes by the proportion of birds that we are find are dead than alive. “Whatever the substance is, it feels like a very sticky glue that has clumped the feathers together. “The birds are left almost paralysed. They can’t fly or preen themselves and just go along with the tide and winds until they hit the shore. “We have found many birds stuck to the pebbles on the beach while others have pebbles stuck to their feathers. The Environment Agency is currently testing a sample of the substance in order to confirm exactly what it is and, potentially, where it came from. Fred Caygill, spokesman for the MCA, said: ”Ships do clean their tanks at sea. “In some cases it can be done legitimately and in other cases it can breach the maritime pollution regulations. A year ago, the IMO belatedly decided to clean up its act. It said shipping fuel should not contain more than 3.5 per cent sulphur by 2012 and eventually must come down to 0.5 per cent. This lower figure could halve the deaths, says Corbett. It should not be hard to do. There is no reason ship engines cannot run on clean fuel, like cars. But, away from a handful of low-sulphur zones, including the English Channel and North Sea, the IMO gave shipping lines a staggering 12 years to make the switch. And, even then, it will depend on a final ‘feasibility review’ in 2018. Smoke and sulphur are not the only threats from ships’ funnels. Every year they are also belching out almost one billion tons of carbon dioxide. Ships are as big a contributor to global warming as aircraft – but have had much less attention from environmentalists. Both international shipping and aviation are exempt from the Kyoto Protocol rules on cutting carbon emissions. But green pressure is having its effect on airlines. Ahead of next month’s Copenhagen climate talks, airlines have promised to cut emissions by 50 per cent by 2050.
carbon-trading scheme to encourage emissions reductions. Amazingly, they pleaded poverty. Two-thirds of the world’s ships are registered in developing countries such as Panama. These are just flags of convenience, to evade tougher rules on safety and pay for sailors. But at the IMO, governments successfully argued that ships from developing countries should not have to cut carbon emissions. IMO secretary-general Efthimios Mitropoulos insisted: ‘We are heavily and consistently engaged in the fight to protect and preserve our environment.’ Yet without limits, carbon emissions from shipping could triple by 2050. Burning low-sulphur fuel won’t cut carbon emissions from ships. But there are other ways. More efficient engines could reduce emissions by 30 per cent, according to British marine consultant Robin Meech. Cutting speed could reduce emissions by as much again. And there are even wackier ways, such as putting up giant kites to harness the wind as in the days of sailing ships. However you look at it, the super-ships are rogues on the high seas, operating under pollution standards long since banished on land; warming the planet and killing its inhabitants. Santa’s sleigh, they are not.